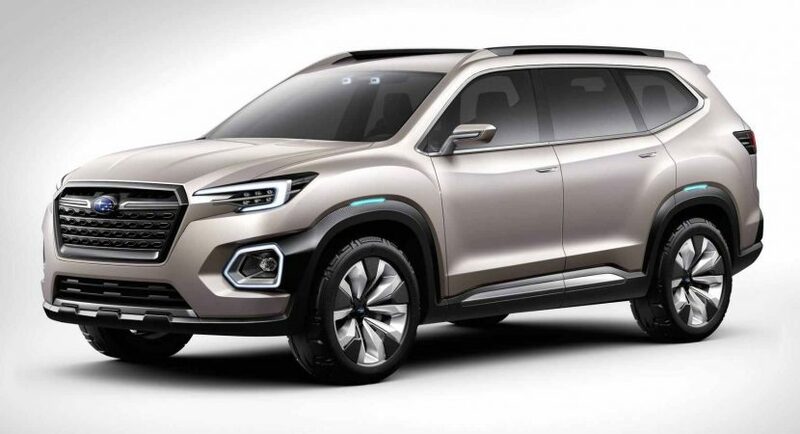 The 2016 Los Angeles Auto Show was a good opportunity for Subaru carmaker to lift the veil of the all-new VIZIV-7 Concept, which will spawn a future seven-seat SUV, all tweaked with the latest technology and a good power package underneath the skin. According to Takeshi Tachimori, CEO at Subaru, “the concept expresses” the carmaker`s “brand values, safety, dependability, capability for outdoor activities and a forward looking attitude.” And speaking about attitude, the SUV has got plenty of it. Visually, the all-new design is inspired by Subaru`s DYNAMIC x SOLID language, coming with the carmaker`s own vision of a futuristic car, with hexagonal shapes which hide the front fog lamps or the rear exhausts, along with straight body lines and rectangular rear lights. Other standout features refer to the carbon fiber body panels or the 21-inch alloys with 265/55 tires. As for the interior, this comes with the latest technology and plenty of room to accommodate seven passengers and their luggage, thanks to the concept`s long wheelbase, which measures almost 3,000 mm. The VIZIV-7 is also 5,199 m long, 1,828 mm tall and 2,030 mm wide, making it longer than the Land Cruiser from Toyota. Even if unconfirmed, the production series model will come with a wide array of turbo flat-four engines under the hood, mostly borrowed from the new Impreza. We should be able to find out more about the powertrains somewhere towards the end of 2017.